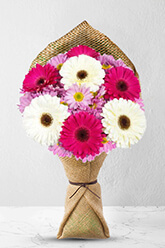 Delightfully colourful and a little bit fancy, these assorted Gerberas and Chrysanthemums, do in combination exactly what they are designed to do; look attractive and make you feel happy. Order Fanciful today.The vase in the picture is not included however to personalise your gift, we recommend a Premium Vase to perfectly accompany Fanciful. Order from Australia delivered to my daughter in NZ same day. Meant a lot to a Granny not able to be there for the birth of a precious granddaughter. To have the availability of having the flowers delivered on a Sunday, Mothers Day was Special. Thank you!